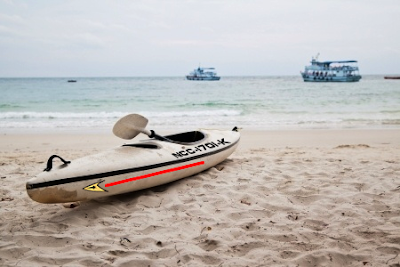 That's NCC-1701-K -- K for Kayak! It really was a good time, despite the 10-knots of breeze and 3-knot current working against us for most of the way. And then, as if spending a morning using muscles I never knew I had wasn't enough, we went to the Enterprise in the afternoon where I took on the daunting task of replacing the steering cable. 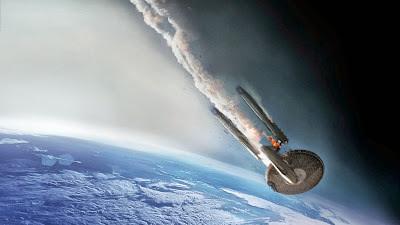 Actually, that's a scene from STAR TREK Into Darkness -- and perhaps an indication that, after all these years, it was a really bad idea to let the Asian guy drive. Anyway, replacing the cable requires a bunch of tools, measuring, disassembling a good part of the steering pedestal and working in a very tight space with much of your body hanging over the swim ladder. There's also a lot of moaning, groaning and cursing in several languages, most of which I had no idea I knew. The next day, we went for a short cruise to test the systems and all worked perfectly. Hopefully, with our remaining few weeks of the season, we'll get some great weather and enjoy the fruits of our labor. So hard to believe, but last night marked the final night of this year's EBYRA Wednesday Night Race Series. This season came and went faster than a Zephram Cochrane engine test (Trekkies will get that joke. The rest of you, it's time to brush up on your trivia so you can keep up next year.) And although we still have the 19th Race of the 18-Race series next week, I've already made arrangements for winter storage in October and a growing list of projects to be completed over the winter, including new portlights, new light panels, outdoor LEDs and, if the finances work out, new interior cushions. Hopefully, before then, the crew will come out for a weekend day trip or two and we'll decide to enter the Charity Cup the week before hauling. As for last night, despite the mantra that "risk is our business", the crew decided, almost unanimously, not to jeopardize our third place standing by actually racing. So, we buzzed past the committee boat, thanked Eben for a year of great work (despite a couple of fetch courses earlier in the season,) and then engaged the warp drive towards Execution Rocks with Captain Dave at the conn.
We then finished the evening at the mooring dining on various incarnations of chicken, donuts, brownies and cookies all while trying to figure out what that hazy light in the sky was next to the moon. After knowing for certain it was not the moon and that all other planets were too small and far too low on the horizon, we finally determined it was a cloud reflection of the 9/11 beacons shooting upwards from downtown Manhattan. What a relief, because the more we looked at it, the more and more reasonable explanation was that it some sort of invading force from above hiding behind the clouds. We were that close to red alert. So we get a third and, with that, a shiny $30 pickle dish to go in the trophy case. In front in the standings was Whirlwind and High Holy Hell Heels. Well done to all. By the way, to all the log fans out there, I should apologize for not recording a log entry last week, which, of course, would fully explain the "High Holy Hell Heels" reference, but the day after racing last week, we took the shuttlecraft to Eastern CT to see Mystic, the Mohegan Sun Casino, and take a ferry out to Block Island to meet up with the Northeast C&C Rendezvous in the Boat Basin featuring 20 C&C boats ranging from a 30 MkII to a 52. Of the most interest were two very different C&C 40's and a 1990 C&C 37R which has the same hull as the Enterprise but is vastly different in cockpit design and accommodations. Basically, if you want to sit in the cockpit, well, there's the floor. It was great to see everyone and share stories of our adventures at sea, but a few people did express their disappointment that the Enterprise did not make the trip. That's work for ya. Hopefully next year the Rendezvous will be a little more West like in Clinton, CT.
On the way back to New York, we stopped at, not one, but two, yes two, outlet malls, firmly establishing that there will not be an Enterprise-C anytime soon. But that's fine with me, because every time I go to one of these rendezvous, I get reenergized about fixing up the Enterprise and adding custom touches. So, over the winter, we'll plan and plan. And, in 2014, the Enterprise will be better than ever, just as it was in 2013 and 2012. Boy, that little droid does get around.